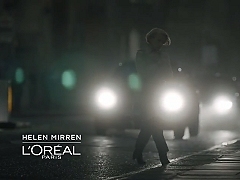 Helen Mirren stars in a commercial for L'Oreal Age Perfect Golden Age. 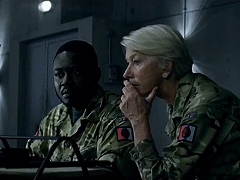 Lieutenant-General Frank Benson (Alan Rickman) and Colonel Katherine Powell (Helen Mirren) discuss expanding the rules of engagement to protect the civilian population. 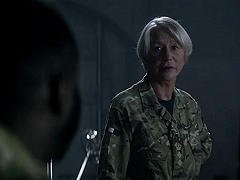 When the mission changes from a "capture" to a "kill", Colonel Katherine Powell (Helen Mirren) is advised to refer up. 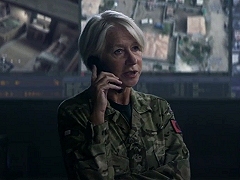 Colonel Katherine Powell (Helen Mirren), a UK-based military officer, discusses the collateral damage estimate for a possible Hellfire attack with her team. 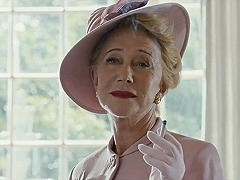 Colonel Katherine Powell (Helen Mirren) monitors the current happenings in the government's drone project. 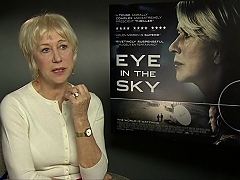 Promotional interview with Helen Mirren, conducted in the United Kingdom, for the theatrical release of Eye in the Sky. 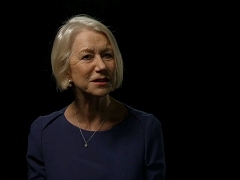 Director Gavin Hood and Helen Mirren are interviewed by Yahoo! 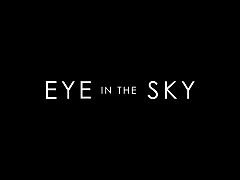 Movies to promote the theatrical release of Eye in the Sky in the United States. 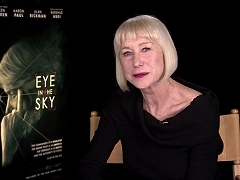 Press junket interview with Helen Mirren in New York to promote the theatrical release of Eye in the Sky. 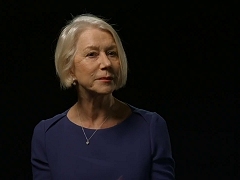 Interviews with Helen Mirren, Aaron Paul and Alan Rickman on the set of Eye in the Sky. 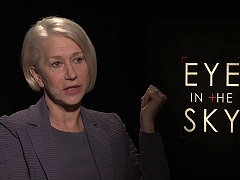 Promotional featurette for the release of Eye in the Sky, including interviews with director Gavin Hood and actress Helen Mirren. Compilation of television spots to promote the theatrical release of Eye in the Sky in the United States. International trailer for Eye in the Sky, directed by Gavin Hood and starring Helen Mirren, Aaron Paul and Alan Rickman. Theatrical trailer for Eye in the Sky, directed by Gavin Hood and starring Helen Mirren, Aaron Paul and Alan Rickman. 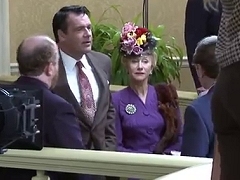 Hedda Hopper (Helen Mirren) tries to get some information out of Dalton Trumbo (Bryan Cranston) and his possible secret writing. 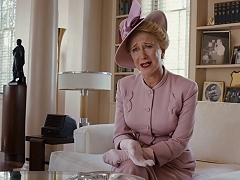 Hedda Hopper (Helen Mirren) engages in a rather one-sided war of words with Louis B. Mayer (Richard Portnow). 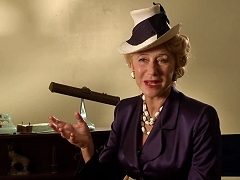 Hedda Hopper (Helen Mirren) shares her point of view with film mogul Louis B. Mayer (Richard Portnow). 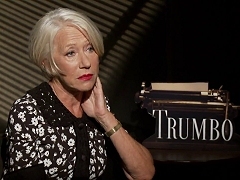 Promotional interview with Helen Mirren to promote the theatrical release of Trumbo in the United States. 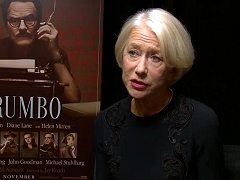 Helen Mirren is interviewed during the British promotional tour for Trumbo. 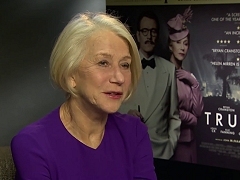 Interview with Helen Mirren to promote the theatrical release of Trumbo in the United States. 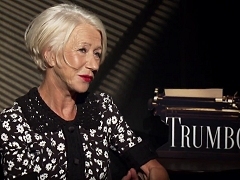 Interview with Helen Mirren on the set of Trumbo. 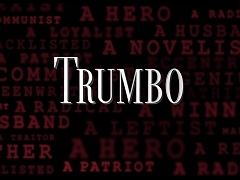 Promotional featurette for the theatrical release of Trumbo, featuring interviews with Bryan Cranston, Helen Mirren, Diane Lane and John Goodman. Scenes from the making of Trumbo, directed by Jay Roach and starring Bryan Cranston, Diane Lane and Helen Mirren. 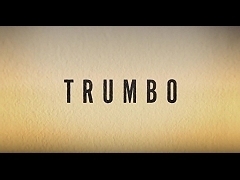 International theatrical trailer for Trumbo, directed by Jay Roach and starring Bryan Cranston and Helen Mirren. 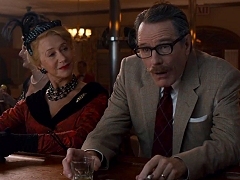 Theatrical trailer for Trumbo, starring Bryan Cranston, Helen Mirren, Diane Lane and John Goodman.